In the modern times, the bathroom doesn’t only serve as the cleanup area in a house, but it can also be a place where we can relieve stress due to the attractive bathroom design. Therefore, many homeowners compete to present such a stunning comfort into the bathroom. One of the bathroom elements that we can explore is the roof. You might be a bit surprised why we choose the roof. We may very often hear about the modern bathroom design that usually only touches the floor, walls or the bathroom fixtures. In fact, the roof is one of the most important foundation elements that can also be explored. The tile or asbestos roof has become a common choice in every home. So, What if we try to experiment with the glass roof for our bathroom? 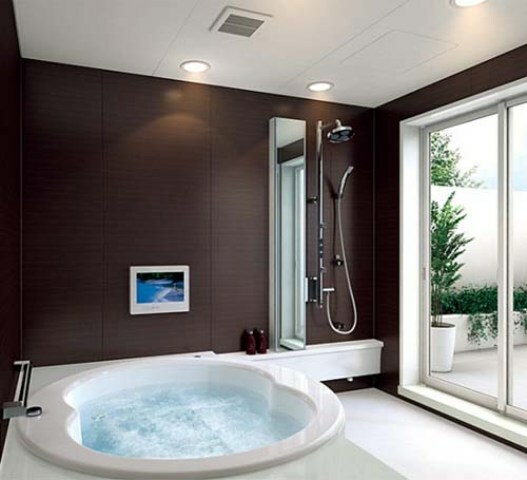 The application of the glass roof is to allow the sunlight to enter the bathroom, which will fundamentally will enhance the atmosphere of the bathroom and improve your bathing experience as well. There are two popular glass roof materials, which are polycarbonate and louvre roof that can be opened and closed. The use of the glass roof is usually applied to the inner court or carport roof, but if we want something different, we can use it in other rooms, such as bathrooms. Which is so interesting about the glass roof is, during the daylight, the frosted glass roof make the room enlightened without getting it too hot. However, this roof material still tends to dissipate heat to underneath, so you will need enough opening size of the air circulation. In the installation, we must consider several things. In order to be weatherproof, use a glass with minimum thickness of 10 mm. The roof construction should be sloping, with a slope about 2-3 degrees. The frame can be made of light elbow steel plate with a distance of each barrier around 50 cm. Applying this type of roof on the bathroom can provide a unique sensation. However, make sure the opening in the bathroom can optimally accommodate the air circulation as well as the heat coming through the glass roof.